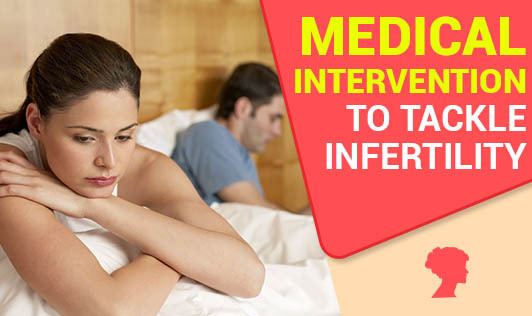 Fertility Drugs: If your cause for infertility is unknown or there is a huge imbalance in you or your partner's hormones, you can go for fertility treatment that would require you to take medication regulate your reproductive hormones and ovulation cycles. Success rates: About 20 to 60% women are able to succeed by taking these drugs. Side effects: They come with side effects like headache, hot flashes, bloating, vaginal dryness, and soreness. Surgery: Genetic defects, blocked fallopian tubes, endometriosis, fibroids, and ovarian cysts can be treated with surgery. A simple laparoscopic surgery should be sufficient in most of the cases. However, in complicated situations, extensive surgeries which require incision in the abdomen may be needed. Success rates: Endometriosis and scar tissues treated with surgery show 40 to 60% success rates. Side effects: Laparoscopy can cause chest discomfort or soreness in the abdominal area. Talk to your expert to know what the best course of treatment for you.